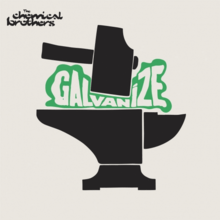 "Galvanize" is a song by British electronic duo The Chemical Brothers and the first single released from their 2005 album Push the Button. It peaked at No. 3 on the UK Singles Chart. It was the highest charting single in their native United Kingdom by The Chemical Brothers since "Hey Boy Hey Girl", which had also reached No. 3 in 1999. In Spain, it reached No. 1 and it held the top spot for two weeks. In Australia, the song was ranked No. 65 on Triple J's Hottest 100 of 2004. The track features a distinct Moroccan Chaabi string sample from Najat Aatabou's song "Hadi Kedba Bayna (Obvious lie)". The main hook of the song is in 6/4 time signature, while the rest is in 4/4. The track also features rapping by Q-Tip (member of A Tribe Called Quest). In part of the song, a sample from the group’s early single "Leave Home" plays. Pitchfork Media's Scott Plagenhoef stated the song along with "The Boxer" "harks back to the duo's early B-Boy/techno days" but missed "the ferocity and sub-bass rattlings of their earlier cousins, and here play second fiddle to unremarkable verses and nasally vocals." It won the Grammy Award for Best Dance Recording in February 2006. The music video was filmed in Málaga, Spain, and directed by Adam Smith. It involves three boys wearing clown face paint, who sneak into a club during a Krump dance fight. One of the boys starts dancing in the dance-off, but they are caught and taken by the police. That same month, an Anheuser-Busch television commercial for Budweiser Select featured "Galvanize". The song also started appearing in NBC's Sunday Night Football coverage in 2008. "Galvanize" was used as walk-on music by darts player Kevin Painter, and is currently used heavily during live T20 Cricket, specifically when a video review is taking place. The song was used to start the entrance of the athletes at the opening ceremony of the 2012 Summer Olympics in London and in Need for Speed: Most Wanted. Its most recent usage is as the opening theme of the MLB Network series Hot Stove. It is also used in a commercial for Mike Holmes 2016 television show Holmes Buy it Right. ↑ "Galvanize - Single by The Chemical Brothers on Apple Music". iTunes. Retrieved 14 July 2016. ↑ Push the Button (Compact Disc liner notes). The Chemical Brothers. United Kingdom: Virgin Records. 2005. 0724356330221. ↑ "The Chemical Brothers feat. Q-Tip's Galvanize sample of Najat Aatabou's Hadi Kedba Bayna (Just Tell Me the Truth) - WhoSampled". WhoSampled. ↑ Scott Plagenhoef (2005-02-03). "The Chemical Brothers — Push the Button". Pitchfork. Retrieved 2016-05-19.